Just throwing this out there to see what kind of feedback I get. I've got a couple of projects that I'd really like to work on. One's fantasy and one's sci-fi. To get past the spinning my wheels phase I gotta decide on system(s). Even though it might be advantageous to go Swords & Wizardry and Fate, I'm gonna go other directions. 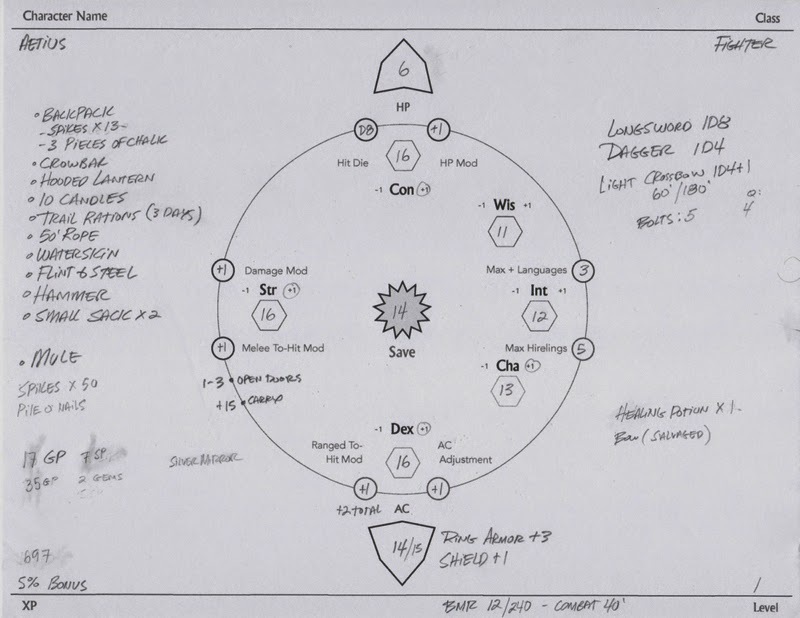 I've been running EABA, Hero and Gurps to explore the universal system field. I like each of them for various reasons, but two things stand out for me regarding EABA. Its universal chart is an incredible game resource and it has an upfront permissive license. The open license and the fact that it's a framework are really attractive. Besides that, there are a lot of shoulders to stand on. Also, I've wanted to explore Fate's roots. Beyond the open license, nostalgia is talking. I played a lot of WEG Star Wars back in the day and it still stands out in my mind. Also, I've blogged here a bit about using Mini-Six to run Traveler. It just worked. Over the holidays, I took a little time to clean up my game PDF folder. There I tripped over Mini-Six. Looking at the game, it didn't take me long to remember why we liked it so much. Since playing Mini-Six, other resources have been published, such as Mighty-Six for supers. Might this be the route to go? I have to admit, this one is always on the table. Eventually I'm going to have to put a stake in the ground to see if it's actually worth pursuing. Other systems/games considered include Fate, Savage Worlds, D100, and so on. All of them are top tier but they just don't fit what's in my head. The Troll Lords' successful Kickstarter is nearing the end. So far, it's beaten my expectations but there's still more to unlock. Castles & Crusades Experimental Character Sheet? I'm playing (yes, playing!) in a Castles & Crusades game and am loving it. What I'm not so keen on is the character sheet. So, I began pondering an experimental sheet. The game has more modifiers to keep track of - more than the other games that I've tackled, which makes an attempt more challenging. Perhaps that's why I should try. Over at the troll dens, the Players Handbook, Monsters & Treasure and the Castle Keepers Guide have all sold out. To rectify the situation, the Trolls have launched a new Kickstarter to bring them back. Heed the call, for color! 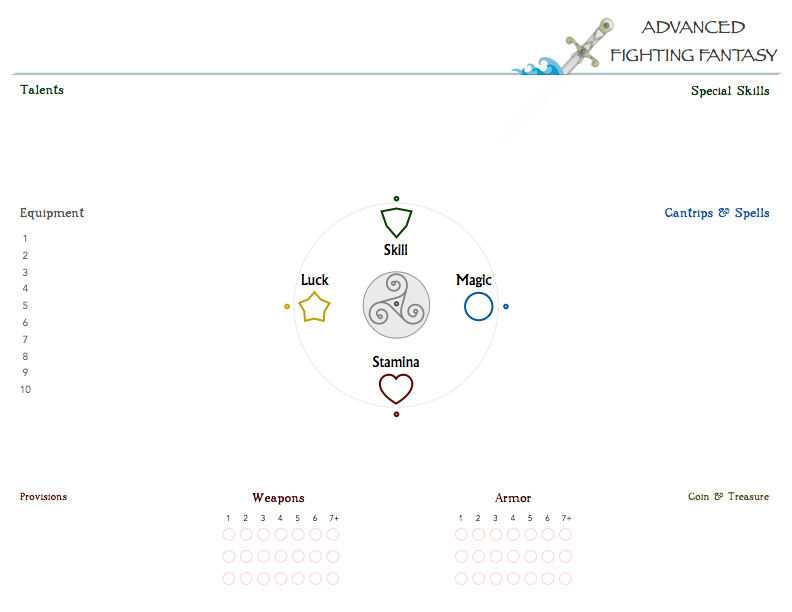 I've been asked to post up an experimental Swords & Wizardry sheet that's in use. A recent moved had 'em tucked away, but I finally tracked one down. 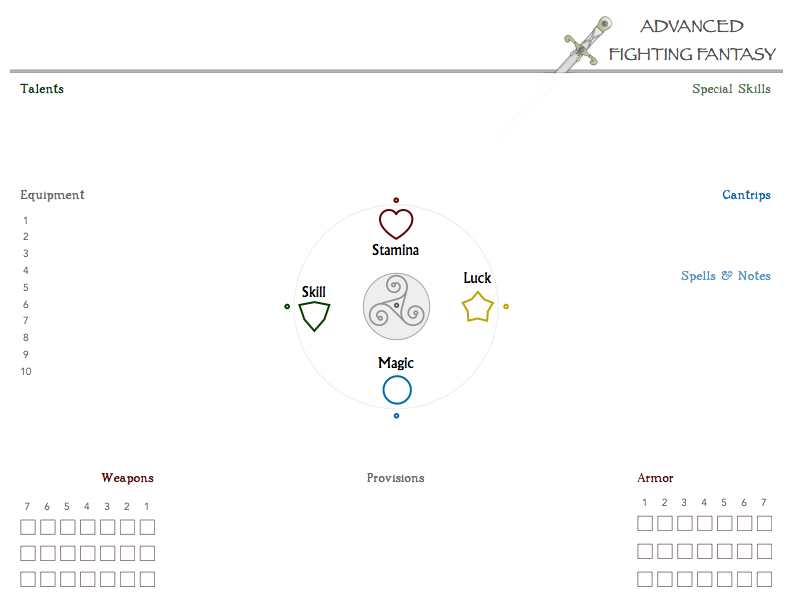 Late last year, I created an experimental Swords & Wizardry character sheet. Now I'm back at it, but this time for Advanced Fighting Fantasy. My goal is to make the sheet as simple as possible while being pleasing to the eye. This one doesn't have much table time yet, hence the 0.5 designation, but I'm hoping to put it to some use here soon.